Lemon & Vanilla: Chicken, morcilla and sherry / Frango com morcela e xerez. Chicken, morcilla and sherry / Frango com morcela e xerez. The new Diana Henry book is amazing and it's all about the chicken. A bird that, here at home, we all love and eat very often. 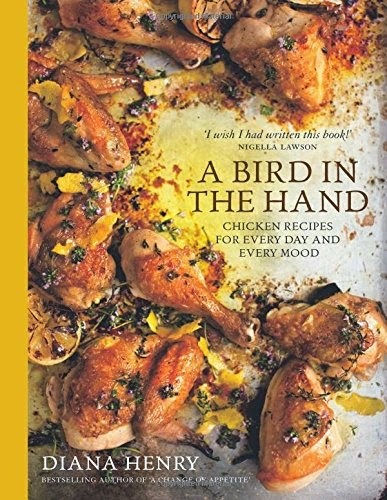 A book full of fabulous recipes that make your mouth water and this one, amongst lots of them that I marked to try, was the first one that I tried. I chose this recipe to try first as I went to a fantastic Spanish deli in Edinburgh and I bought a proper Spanish morcilla that was enough for this recipe and for another one that I'll publish later. The recipe serves 2 but I doubled it to serve 4. 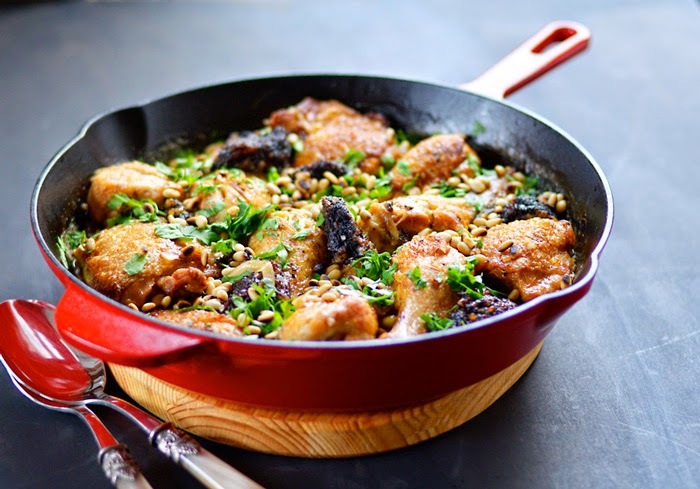 Heat the oil in a ovenproof frying pan that can fit the chicken and morcilla snugly in a single layer. Season the chicken and brown on both sides just for colour. Add the morcilla to the pan and cook it lightly on both sides, then remove it from the pan and set aside with the chicken. Add the onion to the pan and colour it lightly. Deglaze the pan with the sherry, scrapping the base with a wooden spoon to remove all the flavoursome scraps. 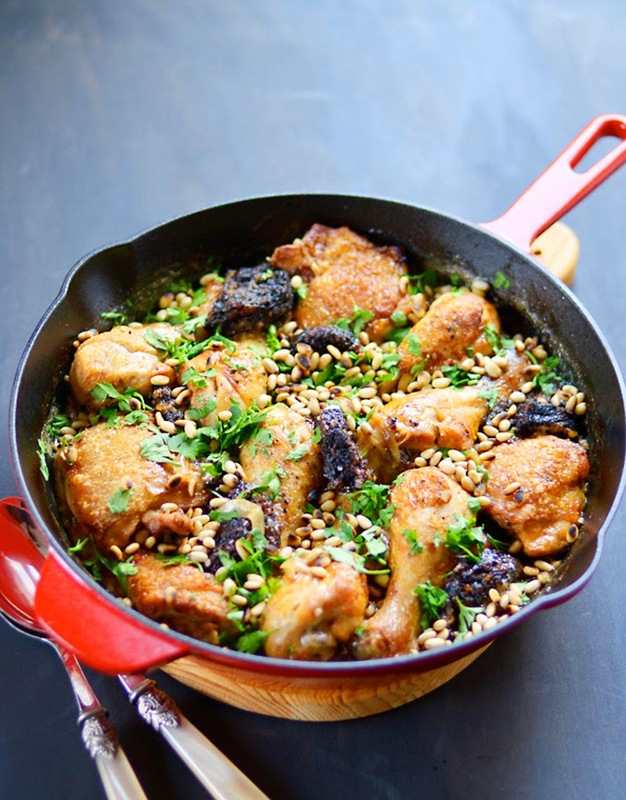 Return the chicken and morcilla to the pan and bake in the oven for 40 minutes or until the chicken is cooked through. Take the pan out of the oven and put it over medium heat. If theres no liquid left, you can add another 3 1/2 tbsp of sherry and stir it in. Pour in the cream, heating it until it bubbles. Sprinkle with the pine nuts and parsley and serve immediately. O novo livro da Diana Henry é fantástico! Um livro recheado de receitas só de frango. Uma carne muito apreciada cá em casa e que comemos com alguma frequência e as receitas são tão magníficas que apetece testar todas! Esta foi a primeira receita a ser testada, já que há uns dias atrás, fui a uma delicatessen espanhola em Edimburgo e comprei uma morcela espanhola fabulosa que foi suficiente para esta receita e para uma outra que vos apresentarei muito em breve. A receita apresentada é para 2 pessoas, mas eu dobrei-a para 4. Aquecer o azeite numa frigideira que possa ir ao forno e que seja grande o suficiente para que o frango e a morcela possam ficar numa camada única. Temperar o frango de sal e pimenta e selar no azeite, a fim de a corar de ambos os lados. Retirar o frango da frigideira e reservar. Colocar as rodelas de morcela na frigideira e fritar ligeiramente dos dois lados. Retirar a morcela e reservar juntamente com o frango. Colocar a cebola na frigideira e fritar até que esta ganhe cor. Não é preciso que fique macia. Adicionar o xerez e raspar o fundo da frigideira com uma colher de pau, a fim de soltar todos os sedimentos que tenham ficados agarrados ao fundo. Colocar o frango e a morcela na frigideira e levar ao forno por 40 minutos, ou até que o frango esteja cozido. Retirar a frigideira do forno e colocá-la sobre lume médio. Em princípio haverá líquido suficiente na frigideira, mas caso não haja, adicionem mais 3 1/2 colheres sopa de xerez e mexam. Adicionar as natas e aquecer até que as natas comecem a ferver. Polvilhar com os pinhões tostados e a salsa picada e servir de imediato. Etiquetas: Black pudding / Morcela., Chicken / Frango., Cream / Natas., Diana Henry., Morcilla, Parsley / Salsa., Pine nuts / Pinhões., Sherry / Xerez.